Blog How much protein do kids need at lunch? How much protein do kids need at lunch? If nutrition trends are accurate, you’re likely looking for ways to get more protein in your diet but have you considered that maybe your kids need more protein in their school lunches? Emerging science suggests that we have underestimated how much protein kids need by as much as 60%. Using more accurate measures of protein requirements, some researchers feel we should up the recommended factor of 0.5 to 0.8 grams of protein/pound body weight/day. For a 60 pound child that works out to eating 18 grams more protein a day or about ¾ cup of Greek yogurt. Ideally that would involve swapping out an empty-calorie food, not just eating more food. We’ve also learned that in order to support tissue growth and repair, we need to spread our protein intake across the day. One big protein pit stop at dinner doesn’t cut it. By the way, the meal most short-changed for protein tends to be breakfast. While the protein research evolves, we can at least make sure school lunches include a good source of protein. It supports growth and curbs hunger so kids can focus on school work and not a grumbling tummy. Offer a variety of whole or minimally processed protein-rich foods in your child’s school lunch. The nutritional benefits of tofu, steak, salmon, eggs, seeds, yogurt and beans are vastly different so mix it up. Foods like meat, fish, poultry or tofu are high in protein so one 1/4 cup portion for younger kids and 1/2 cup portion for older kids is fine. Foods like beans, edamame, chickpeas, lentils, pumpkin seeds, hemp seeds, eggs, cheese, yogurt, milk or soy beverages are more mid-range in protein. I’d pack two smaller servings from these groups (eg., 1/4 cup beans, couple tablespoons of hummus, 1 oz cheese, 1 egg), maybe even a third such as a sprinkle of sunflower seeds on a salad. My point is a little hummus on a wrap or few beans in a vegetable soup should be paired with another protein to help make sure your child gets enough. 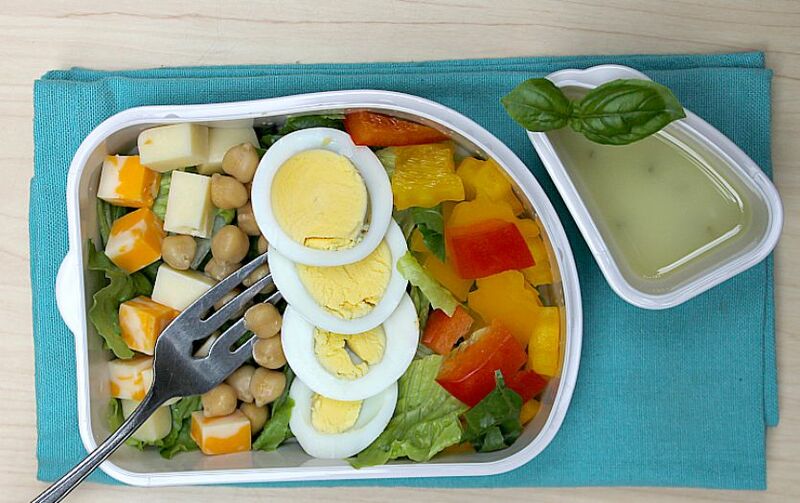 Cobbs salad with hard-cooked egg, few chickpeas and cubes of hard cheese, mini carrot muffin, water. Wondering about quinoa, rice, muffins and bread? They have smaller amounts of protein so I don’t count them as a protein choice. Do you have any questions about protein and kids? I’d be happy to answer them.